In September of 2016, we attended the Specialty Graphic Imaging Association (SGIA) trade show in Las Vegas. To predict the printing trends that I thought we’d see, I wrote a blog on the Expected Industry Trends from the SGIA Expo. To document my printing prophecy, I followed up with SGIA Sightings, a recap. At SGIA we got up close and personal with two of Zünd’s newest automation features. In my recap, I loudly proclaimed our love for Zünd digital die-cutters and this awesome new technology. The love story was mutual and Custom Color was invited to contribute to the December issue of Sign & Digital Graphics magazine’s Making Finishing Solutions as Easy as ABC. This opportunity for contribution made me think about my appreciation for our automated cutting machines. At Custom Color Corp, our motto is “Ink Big. Ink Fast. Ink Printing.” Without the quick cutting capabilities of our three Zünd digital die cutters, we wouldn’t be able to Ink Fast – which is quite obviously a problem in today’s fast-paced world. Digital printing has a quick-turnaround reputation, and for good reason. Because customers recognize that the printing process is speeding up, they are requesting more displays and shorter run times. Zünd cutters provide the increase in productivity that customers expect. On any given day, our I-Cut operators process hundreds of thousands of square feet of material. Not only is the act of cutting the material automated, our Zünd cutters are tied into our workflow. This workflow accessibility means increased accuracy and efficiency. We are able to estimate cut times through integration with our company management information system. 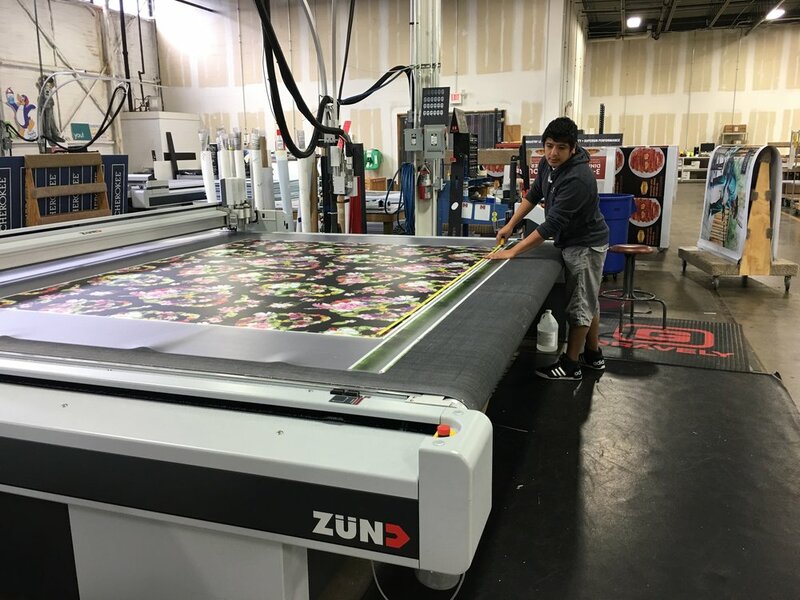 One of our Zünd cutters touches each and every large format project that comes through our production facility. Three Zünd cutters provide the cutting needs for our flatbed, latex, fabric and UV printing – the versatility of the machines to finish any substrate prevents a bottleneck in our production flow. Zünd’s upgradability is unparalleled. This adaptability to new projects ensures that Custom Color can remain an ever-innovative print service provider. Zünd increases our productivity and reduces our production time. Our Zünd cutters are an integral function of our facility and our motto – ink big, ink fast, ink printing. Want to see our Zünd machines in action? Contact us for a tour. Jason Milbourne is the Vice President at Custom Color Corp. A designer, pre-press connoisseur, and Royals fanatic by day and a fantasy baseball pro and taco and craft beer arbitrator by night, Jason loves all things fun and crazy….just like his hair. Connect with him on LinkedIn, but don’t follow him on Instagram, because he won’t follow back. In the world of large format printing, our sales team is often approached with projects that are so amazing that they can’t help but take them on. When our sales executives work so hard to successfully execute these projects, we can’t help but to share their experiences. Susan, our director of business development, was contacted by Wrangler to work on the graphics for their Cowboy Christmas retail expo at the National Finals Rodeo. With her prior success in retail graphics executions, Susan knew that she could bring so much to the table. Wrangler was seeking maximum exposure for their Cowboy Christmas, a retail shopping experience, that took place during the rodeo – they knew that they needed large eye-catching graphics that were sure to appeal to customers. Knowing about our experience with tension fabric products, the Wrangler team onboarded Susan to help their graphic designs dreams come to life. A large suspended rectangular aluminum hardware sign, complete with tension fabric graphics, hung from the ceiling. The 36 foot by 24 foot sign had a dynamic impact on all visitors as they approached the Wrangler Cowboy Christmas retail expo area. The outer area of their booth was adorned with fabric graphics that brilliantly displayed their "throwback" designs for the event. The Fan Fest area, where visitors could participate in a life-size dice game, was completed with fabric walls that distinguished the perimeter for their space. After the closing events, the elements were removed, crated and will be ready for next year. Guests, rodeo participants and other retailers at the event commented on the booth and the impact of the graphic elements. For Susan, the opportunity to “ink outside of the box” and the time spent with Wrangler during the design and implementation of the project was a terrific experience. It doesn’t hurt that she was named a front row VIP and got to experience the thrill from one of the best seats in the house. Susan said it perfectly when she explained our role in an innovative partnership. “Our goal is not to be all things to everyone, but to find the clients that truly appreciate the partnership we provide.” That mantra is what makes our clients want to team up with us on their printing projects. When asked why she loves print, Susan said, “Being able to bring value to my clients is the reason I love my job and why I love working at Custom Color.” Kudos from Kansas City, Susan, this was a project exuding with value for our clients. Want to hear more about Susan's project? Connect with her on LinkedIn! If you’re looking for a great printing partnership or need to wrangle a large format printing project, request a quote today. W. Edwards Deming, American scientist, once said, “Innovation comes from the producer – not from the consumer.” We recognize that we’re not the sole innovators on print projects, but rather innovation captains. This quote reminded us that we, as producers, are responsible for the successful execution of innovation. At Custom Color, the foundation of our success lies in innovation. We’re a group of trendsetters who work systematically to find new and fresh solutions to our client’s printing problems. The solutions to our customer’s printing problems lie in our material offerings. We store a standard stock of over 200 materials that work for a majority of our client’s projects. However, in order to stay on the cutting-edge and to anticipate marketplace changes, we must introduce new materials into our offerings. How do we find out which materials to introduce? We listen to our customer’s needs. We scour trade shows and meet with vendors to find materials that our client’s have never seen before. Then we find the products at the highest quality possible that we can introduce for the lowest price to our customers. Finding the product is just the beginning. Every company, regardless of industry, always wants to offer their clients the best products and services – at Custom Color, we’re no different in that regard. Unlike every other company in the world, we have to go through a much more extensive and complex process before offering new products to our clients: profiling. Printers and materials do not have one-size-fits-all properties. Each printer and material requires special amounts of ink, a certain speed and a precise degree of heat in order to render a perfect print. In order to guarantee the color that our customers have grown to depend on, the profiling step is crucial. After an initial trial test print, our purchasing department works with the press operators, the RIP team, the production manager and our color management expert to determine the printer settings that will ensure that the final product matches the graphic on the customer’s screen. After getting the settings just right, our color management expert will work to certify the material to G7 Master Qualification standards. We check for multiple factors when introducing material. We look at the ink consumption, sublimation, color, the stretch and whether it creases or wrinkles. If the material meets our Custom Color standards and cooperates with our workflow, we’ll introduce the product to a permanent spot on our substrate lineup. We have a very aggressive material testing and profiling process. Usually, we test four or five materials per month. Our vendors have noted our profiling process, too! We have been selected to be the primary research and development testers for one of our biggest vendors - this means that we have the opportunity to print on the newest materials before they hit the market. We walk the walk. Because we’re all about innovation, we’ve introduced two new materials to our Global Shop booth. If you’re a qualified buyer and will be in or around Las Vegas between March 28 and 30, register here for a free pass to the show to check out our booth! If you’re interested in learning about other new materials, drop me a line. I can’t wait to work on innovation with you. As the Custom Color Purchasing Manager, Josh VanMeter is the keeper of the company credit card. When he isn’t scouting out the best material deals, he is either shopping at Costco or Gap, looking around Amazon or dreaming about San Francisco. Connecting with him on LinkedIn is a wise move, he’s a rising printing star. Millennial – while the term may be synonymous with technology-and-wine-driven young people, it’s more appropriate to view this generation as a force to be reckoned with in every industry, including print. To better define millennials, they’re the generation of young adults born between 1980 and 2000 – their size exceeds past generations with 83.1 million people representing more than one quarter of the population. This group possesses over $200 billion in direct spending power per year. Moreover, it is estimated that millennial consumerism will surge to an estimated $1.4 trillion annually by 2020. Jeff Fromm, FutureCast President and millennial marketing expert, defines the Millennial Mindset in six categories: social circle, self, innovative, trusted, purposeful and accessible. In a recent seminar, Fromm explained the extensiveness of motivation for millennial’s stated and derived importance: what millennials say is important versus the money that they spend on a brand to express importance. This seminar, while intended to help B2B companies, made us think about millennials in a different light. As millennials come into the workforce and baby boomers phase out, many millennials are occupying positions such as print buyers, design directors, and planning and allocation specialists in various retail development roles. We recognize that working with millennials to produce print products is different from what we’re used to, so we’ve altered Fromm’s millennial mindset to rethink how we interact with this new generation of print professionals. While many millennials might not jump at the opportunity to discuss large format printing within their social circle, print professionals crave collaboration. Fromm explained that the ABC of working with millennials is Always Be Collaborating. When scheduling meetings with clients, our sales executives work to include team members of all levels. Bridget Suarez, Custom Color Account Executive, makes a spot at the table for millennials because “they’re authentic and they care more about what others feel about the brand than what the brand thinks about itself.” Even print professionals new to the industry can contribute quality feedback and suggestions that add fresh new perspectives to old printing principles. Brands that build an emotional connection with millennial consumers have better brand performance – the same is true when interacting with millennial consumers that are representing their companies. Utility is important to millennial employees. We value our millennial customers by providing customized experiences through research and development, facility tours and showing our loyalty to their brands. Millennial consumers want novelty, efficiency and effectiveness in product innovation. One of our motivators at Custom Color is to make store-level install as easy and as seamless as possible. Using silicone edge graphics and fabric frames provides an effective, high quality aesthetic that requires effortless install, which in-turn increases store efficiencies. Whether store managers or store associates, millennials across the retail spectrum appreciate the innovation of SEG Graphics. Millennials are unconvinced by advertising – they are so skeptical that only about 1% of millennials claim that a compelling ad influences them. When discussing our services with millennial print professionals, we’ve found that they want data. Because of this, we’re taking the time to compile the numbers that they need. A catchy song and commercial might make them contact us, but we’re betting that our statistics impress them more: 1.5 million kits distributed with over 99.95% accuracy, thousands of vehicles wrapped, and over 15,200 jobs in the past 12 months. Millennials want brands to possess purpose. Companies that are good to the world and that are committed to making earth a better place will stand out to millennial consumers. One aspect that millennial print professionals appreciate is that Custom Color strives to be as environmentally conscious as possible. The ink used by our three HP 3500 latex presses contains no Hazardous Air Pollutants (HAPs), are nickel free and have obtained Greenguard Gold and Ecologo qualifications. All millennial professionals seek accessibility – after all, they have the world at their fingertips. We’ve found that by incorporating live chat into our website, we’ve made ourselves more accessible to our clients. In a meeting? Don’t want to pick up the phone? No problem, chat allows us to answer questions, share photos and ideas and work with customers to place orders. Millennials yearn to be more than “media-connected,” “savvy” or “technology junkies”– they want to be treated like the purchasing superpower that they are. At Custom Color, we will continue to evaluate our strategies to accommodate the millennial print professionals that we work with. The statistics behind trade shows are staggering. If you knew that 81% of trade show attendees have buying authority or that 78% of trade show attendees travel more than 400 miles to get to the show, then maybe you’d be prompted to rethink your trade show marketing. If your company is anything like us at Custom Color, you are always looking for opportunities to meet and strengthen relationships with clients, you have an investment in your brand, you’re ready for company growth and you’re looking to outshine your competition. Trade shows provide the perfect opportunity to check all of the above boxes. Before you can reap the benefits of awesome new customers and higher sales numbers, you have to consider the type of trade show booth that will be most attractive to your customers. For some of our clients wanting custom and more complex exhibits, we have compiled this trade show timeline to help guarantee a flawlessly executed event. Approximately six months before the event start date, you should request to meet with one of our sales executives. In that initial consultation, we’ll discuss your budget and how we can get you the biggest bang for your buck. During your consultation, we’ll want to know if you’re interested in custom flooring, suspended structures, walls, windows and frames and fabric. Our offerings are extensive and can range from $100 to $50,000 depending upon your needs. We request that art files are submitted eight weeks prior to the exhibit’s arrival at the show. Following our art requirements will cut down on production time and will ensure that your art comes out looking its best. After our prepress process, our master press operators and finishers will get to work creating the graphics that will capture attention. 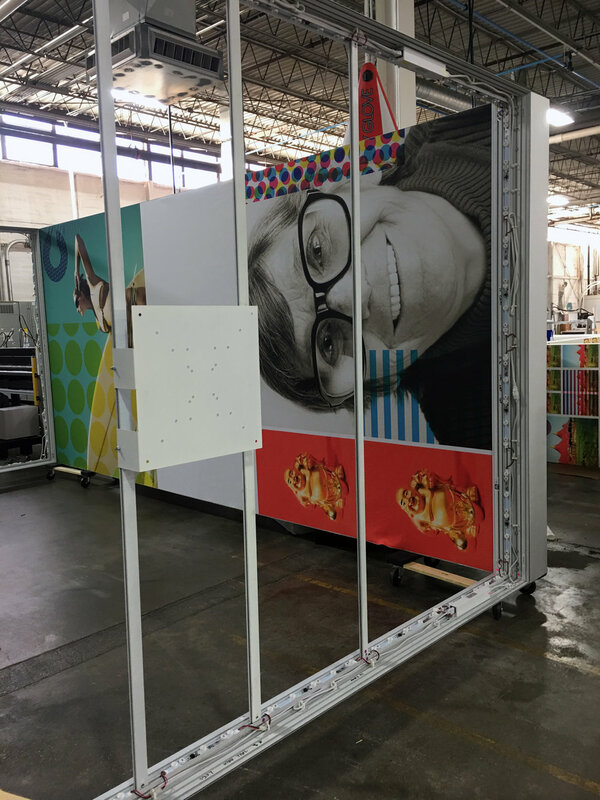 If required, frames from SEG Systems will arrive at our Color Castle approximately six weeks before the show. This gives us enough time to construct your booth and test the graphics so that we can confirm a flawless fit. Following this timeline ensures that the booth will be complete one month before the start of the show and allows for any changes to be made. Generally, the show determines received shipments and set-up dates. Building a custom trade show booth with us means that your prints will be of the best color image quality (thanks to our G7 Master Qualification), you’ll gain unlimited access to our high levels of service and knowledge in the trade show industry and we’ll facilitate the shipping to ensure that your booth arrives in the best condition. Creating a captivating and custom trade show booth requires a bit of strategy and lot of creativity. Thankfully, we carry a hefty trade show resume and can assert just the right amount of tactic and vision to boost your booth. Here’s a little bit of inspiration and a view of what your trade show booth could look like. Let us know if you want to talk about boosting your brand at the next show you attend. In the business of printing, it is literally impossible to be the expert at every single offering. Printing is pervasive – from substrates to equipment to fixtures – being a master at everything is unheard of. Despite the improbability of retaining such massive amounts of information, customers expect expertise. The secret to exceeding customer’s expectations is not to learn everything on your own, but rather to form partnerships with other experts. Enter SEG Systems. Amazing fabric graphics need equally amazing hardware, fixtures, frames and displays. Through high-end technology and a vision for the future of the display industry, SEG Systems remains a leader in display frame manufacturing. Our partnership with SEG Systems ensures that we offer our customers the best in fabric printing and hardware displays. Since partnering with SEG Systems in July of 2014, the success rate of our fabric display solutions has dramatically increased. Perhaps our successful partnership is due to the copious amount of brainstorming that we do when we’re together; however, it’s more likely because we support each other’s businesses like it’s our own. What makes a great partnership? Some would say that communication or attentive listening is among the pillars to success. Others might believe that shared interests are key. I’m going to say it’s probably all of the above. Our relationship with SEG Systems is one of communication and listening. Even after three years of collaboration, we still communicate frequently to ensure we’re on the same page. Our shared interest is simple: to forge ahead the fabric display industry while manufacturing the most innovative, imaginative and impactful display solutions. We’re in the business of growing our client’s businesses - we choose to do that through fabric printing and with SEG Systems by our side. Innovation and the embrace of change and technology is another indicator of a solid partner. Their offerings go beyond their 35 stocked extrusion profiles and aluminum frames. SEG System’s expert engineers and master production team have grown their repertoire to include wood, acrylic and steel. Customers can also choose from 11 types of lighting technologies for backlit graphics. To step it up a notch, 3D elements such as TV mounts, brackets, shelves, acrylic vitrines and dimensional letters can be added. For our customers, one of the greatest aspects of our partnership with SEG Systems is the simple and seamless ordering process. Instead of communicating with two different companies, all communication is facilitated between us. Our Account Managers focus on the every detail so customers can focus on other things, like graphic rollouts and revenue expansion. They say that all good things come in pairs – that’s exactly what you’ll get when you work with us. Together we’re advancing displays with state-of-the art technology while assisting our customers in growing their businesses. If you’re ready for an all encompassing display solutions company, contact us today. Matt Keith is the CEO at Custom Color Corp, also known as the captain of the printing process from idea conception to kitting and shipping. He doesn’t enjoy talking about himself in third person, but he is a big fan of Motocross Racing. Connect with him on LinkedIn. It’s no secret that with every New Year comes a slew of resolutions that people create out of desire to better themselves. Data has shown that approximately 40% of Americans set well-intentioned, self-improving goals for their next trip around the sun. At Custom Color, our team is no different. While many of our Color Crew has their own personal resolutions, many of them have printing promises that they’re looking to keep in 2017. Kim Podolski, Happiness Hero, vows to “control the chaos” in 2017. Rick Holzrichter perfectly wrapped up the more serious resolutions by saying he wants to “contribute to company success” in his year as a Happiness Hero. It’s exciting to bring in the New Year with a fantastic crew who brings their very best to the table. In 2017, Custom Color will print better for our clients while bettering the print industry. Watch our resolution journey by following us on Facebook, Twitter, Instagram and LinkedIn! Wondering About Windows? A Q&A. Josh’s recent Perfect Window Advertising blog starts out by explaining how underused, but incredibly effective, perforated window film is as an advertising medium. While reading about his take on perforated window film, a thought hit me: windows are awesome. Perhaps while reading his blog you had some questions about window graphics. I’ve outlined some of the most common inquiries that we receive when discussing window advertising or design with clients. Why are windows so important anyways? We’ve all heard the quotation, “you never get a second chance to make a great first impression.” This statement is so true, and should be applied to all relationships, especially those with customers and prospects. In reality, windows give retailers an opportunity to make the best first impression. Looking to build and express your brand? If so, a blank window is not the way to go. Successful window signage will draw customers into your space to interact with your product or service. Windows provide an ideal canvas to advertise promotions and specials. Your customers might not follow you on social media or read your ad in the newspaper – instead of making the passersby wonder about your offerings, tell them! Long story short – window graphics are instant, inexpensive advertising for your business or organization. I run various campaigns and need a window graphic that is easily removable – is that possible? Of course! Just like all of our materials and applications, we have multiple options for removable window advertising! The most commonly known removable window advertising option is static cling. We carry a 4 mil cling in both clear and white – this no-adhesive cling produces a one-sided print. Static cling looks best when applied to a smooth and clean, nonporous, indoor or outdoor surface where humidity and other external elements will not come into contact with the graphic. Perforated window film is an incredibly popular substrate at our Color Castle. For years our customers have been asking us about an inside mount perforated window film with a reverse print. We’re now able to deliver– even businesses in municipalities with regulations against outdoor mounted window graphics can still benefit from window film! I want removable and reusable – have anything like that? An option that is very similar to static cling is glass adhere. This substrate is comprised of many microscopic suction cups, which adhere to glass without glue or static electricity. Glass adhere holds to any smooth surface, has the potential to be repositioned and reused, and lasts indefinitely when used indoors. One of our more popular, non-permanent and reusable graphic options is easy dot, a vinyl that features special air release properties, which allows for both bubble- and wrinkle-free installation. Easy dot is a guaranteed easy installation, as it does not require special tools, equipment or training. At Custom Color, we offer white and frosted clear, both of which are perfect for windows! Absolutely! For a more cost-effective option, customers opt for a thin card stock or styrene. After printing on both sides, our master finishers use a GBC air release laminate on the window side of the print. We can also print second surface on a 4 mil optically clear material and flood with white ink. Sandwiched in between the two layers is a block out material to prevent graphic bleed through. A first surface print on 4 mil optically clear finishes the graphic off. Do I need to hire a professional installer to apply these graphics? Installation is no longer an excuse for not employing window advertising. Special tools and training are not required to install static cling, glass adhere, easy dot or double-sided prints. The lack of special requirements makes it easy for anyone, from teenage employees to franchise owners, to apply these substrates to windows. Window advertising is great, but I want something for interior decoration. You’re in luck! We have worked with many companies to renovate and innovate everything for office interiors, from wallpaper to windows. Sprint recently underwent an office redesign. We worked with Rees Masilionis Turley Architecture to create the appearance of etched glass, without going through the trouble of etching the glass. Through a little bit of research and development, we discovered a new usage for 2 mil optically clear isotropic adhesive. We printed a combination of white and black inks at different opacities to create the illusion of etched glass. This layered effect was installed in full sheets rather than cutting and weeding the vinyl, which reduced turn around time and cost. This professionally installed permanent window option is much more cost effective than etching all of the glass in their office. Windows are an underrated advertising space – they are oftentimes an afterthought to in-store signage and POP displays. Now that you know the many different options for window advertising, hopefully you’ll leverage the advertising capabilities of windows. Even if you’re not looking to use your windows for advertising, they can certainly be dressed up to revamp the look and feel of your office space. Our customers will attest to this improved (and affordable) design upgrade. Maybe you shrugged before when I said windows are awesome – I’m confident that you see their full potential now. Whether you’re looking to use window graphics to boost your brand or overhaul your office, you won’t be sorry. Want us to work on your window graphics? Let’s chat. It’s unique in that the creator, Ogilvy Brasil, embedded salt particles into the ad’s paper. This change in thought – the alteration in creativity – produced an interactive print advertisement. The final product is one to file under “useful print advertising” – readers are instructed to soak the ad in water, wrap it around a beer and stick it in the freezer. The beer will be chilled in half the time it normally takes thanks to the second largest advertising agency in Brazil’s ingenious thinking. Not only did this get me thinking about a good brew, this small two-page magazine spread also sparked thought about innovation in large format printing. It’s no secret that the research and development process is an important step in the printing world. However, many designers and development teams disregard the process as too costly or time consuming. Perhaps it’s your 2017 business resolution: you’ll capture the attention of your audience with your print media. Maybe you’re experiencing competition from the business next door. Whatever the case may be, if you’re serious about drawing customers into your goods or services, it is a must to have a conversation with a research and development team about interactive print media. At Custom Color, we combine both interactive print media and substance to create cost-effective solutions to print problems. As a researcher and developer, I have created products that not only attract the eyes, but also appeal to the senses. These branding cubes capture attention with height and messaging. Each side of the tower features its own message and focuses on different products; this encourages consumers to walk around the display to see the different offerings. Adding baskets of products directly onto the display can transform the blocks from an informative piece into a point-of-purchase display. Upselling has never been so easy. With cost-effective construction and interaction in mind, the wheel of choices was born. This spinning interactive wheel suggests drinks based on sandwich offerings, and vise versa. This b-flute print product focuses on the consumer’s buying journey. Pancakes and chocolate milk, anyone? Combining print with other sensory-engaging methods is another way to guarantee a memorable experience. Recently we worked with Graphic Image Flooring to produce G-Floor for the Miami Children’s Museum – after install, the G-Floor has transformed into a surface for interaction. Weight-activated technology triggers sound and light to play music and illuminate the surface of the flooring. Brainstorming the combination of medias is one thing that we do best. When making your print plans for the upcoming year, remember that interactive large format printing is a trend that is here to stay. Whether you’re looking to make your prints interactive or combine printing with other technologies, an initial research and development meeting is your best bet. Want to talk about your research and development strategy for interactive print? Drop us a line! Brett Saunders is the Vice President of Finance and Development at Custom Color Corp. Brett spends part of his days wondering how to combine his loves of product research and development, Haribo gummy bears, large format printing, and all things Disney. The rest of his time he oversees the company finances and productivity. Connect with him on LinkedIn. While I can think of a million advertising mediums that companies forget about or take for granted, one of the most prominent that comes to mind is perforated window film. While I can think of a million advertising mediums that catch consumer’s attention best, one of the most prominent that comes to mind is perforated window film. Coincidence, right? The greatest reason for window film is this: your business can have outfacing visual advertising that entices customers to walk in your doors. Windows prove to be a fantastic advertising canvas – using perforated window film gives business owners the opportunity to use all available space to advertise, without sacrificing the benefits of windows and the natural light they allow in. Perhaps more organizations would use perforated window film if they better understood its properties and all of the possibilities that this pressure sensitive film offers. Some city governments and property owners have regulations against materials on the outside of the window – because of these rules, some businesses think that they must dismiss outdoor advertising all together. Fortunately for them, our 70/30 option is a clear and inside mount. The image is printed in reverse and mounted on the interior of the window. That’s right, you can still gain all of the benefits of window-perforated film without breaking the rules or obtaining costly permits from your municipality. Our outside mounted films are printed with latex ink. These graphics are perfect for sensitive environments, like hospitals and restaurants, because the ink contains no Hazardous Air Pollutants. Organizations that handle sensitive information benefit immensely from window-perforated film – information can be hidden from the public while still providing employees an unobstructed view of the outside environment that surrounds them. Lessors renting out office and business spaces oftentimes employ window perforated film when they start to see their energy costs trending skyward. Other businesses looking to alleviate the burden of the sun’s rays often look to window perforated film to help cool their space. Museums and art studios wield the printed area of the film to protect interiors and artifacts from fading caused by the sun’s UV rays. Using window-perforated film on fleet vehicles, in addition to vehicle wraps, ensures a consistent design across the car, truck, van, SUV or bus. Film on vehicles also creates a more comfortable ride for drivers and passengers by eliminating excessive heat and providing UV and glare protection. Stop taking the windows on your businesses, leased spaces and automobiles for granted! Perforated window film is incredibly easy to self-install and leaves behind no residue when removed. Make your windows work for you by advertising outwardly to customers and by creating a comfortable and safe interior environment. Without any negative implications of perforated window film, what are you waiting for? Want your windows to be included in 200,000 square feet of perforated window film that we print a year? Contact us today.